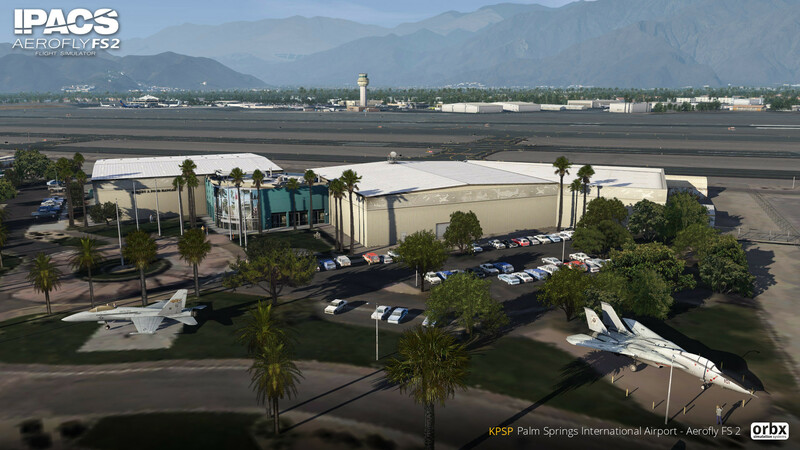 I'm incredibly delighted to announce my next foray into IPACS Aerofly FS2: Palm Springs International Airport! Hot on the heals of the truly ground-breaking TrueEarth Netherlands, I've been fine-tuning the last bits and pieces to bring one of my favourite airport projects over to AFS2. 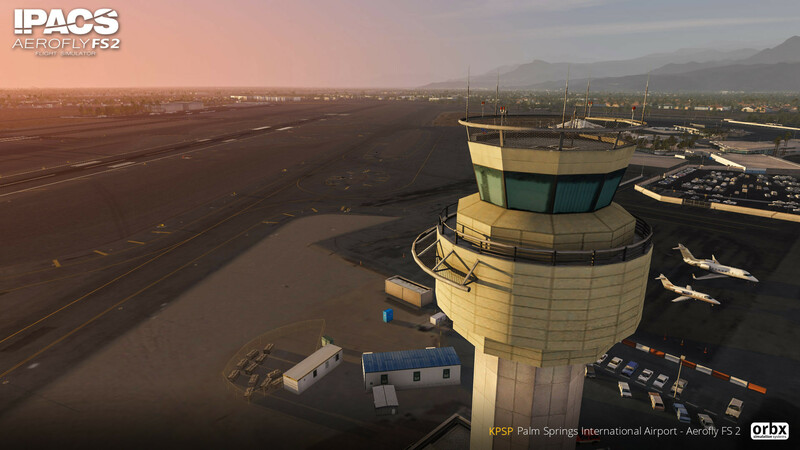 A much-loved ORBX destination, the airport was originally released for FSX and P3D and has been brought to life for the new simulator. 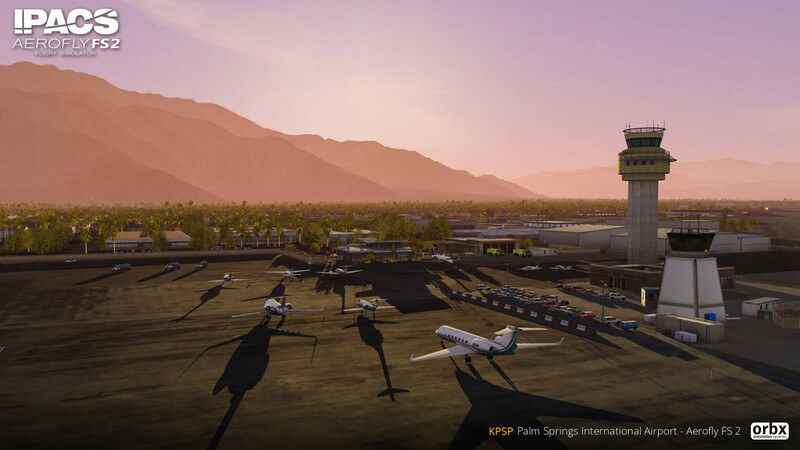 Perfectly situated a short hop away from Los Angeles, Palm Springs ranks is one of the most dramatically beautiful locations within the United States. 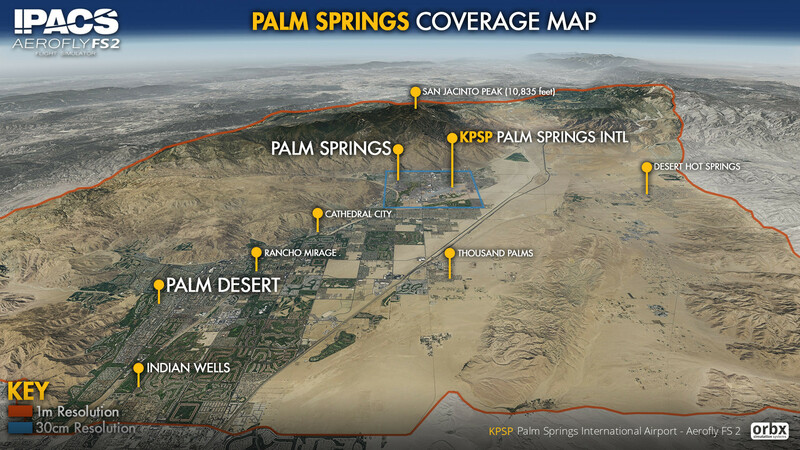 Much like other recent airports brought over to AFS2 (shout-out to Monterey Regional and Eagle County), Palm Springs was chosen as it sits smack dab in the middle of the default Aerofly default coverage area. 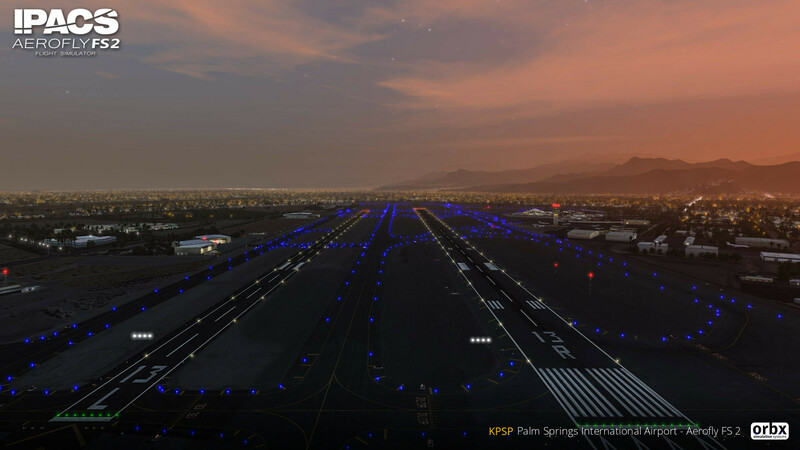 This means that not only do you have several ultra-HD ORBX destinations to visit nearby, but you also have a seamless transition and plethora of beautiful photorealistic locations to visit en-route. 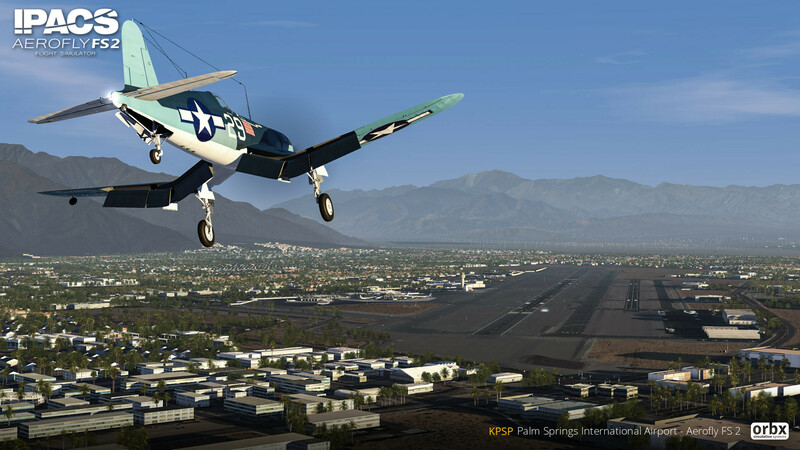 For those not yet to experience Aerofly FS2 itself, look forward to incredibly performance-friendly simming and stunning terrain visuals. 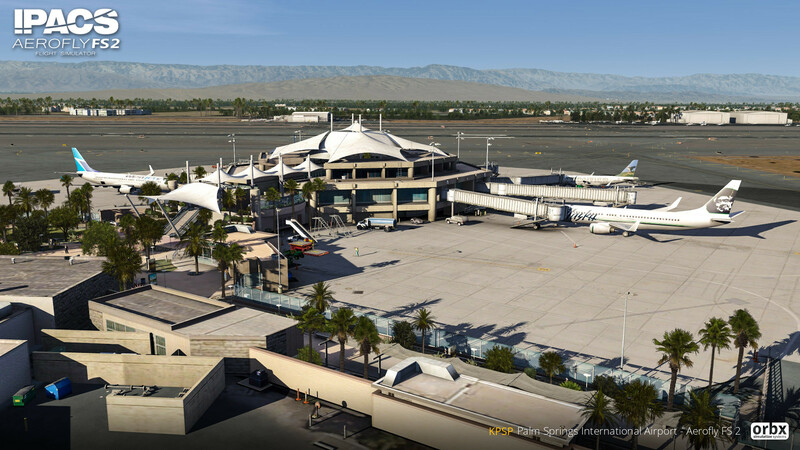 The IPACS team have also created new cultivation types for this airport; expect to see new vegetation types not seen in previous ORBX Aerofly releases. 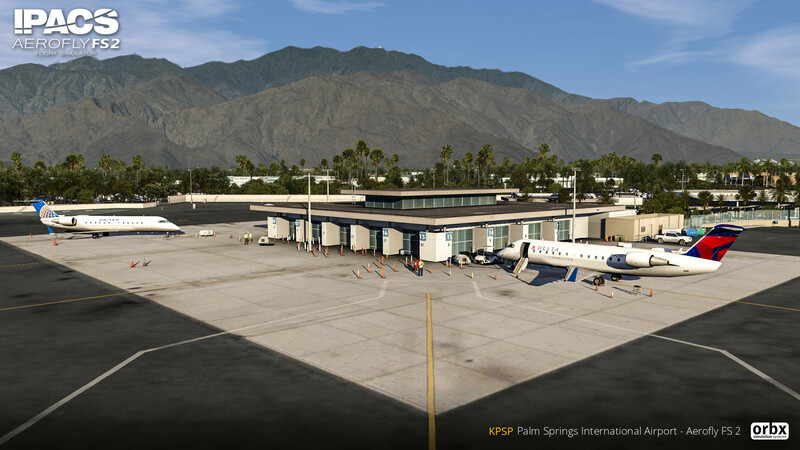 As with many of my recent airports, Palm Springs includes an enormous 1500 sq km area covering a wide variation of topography. 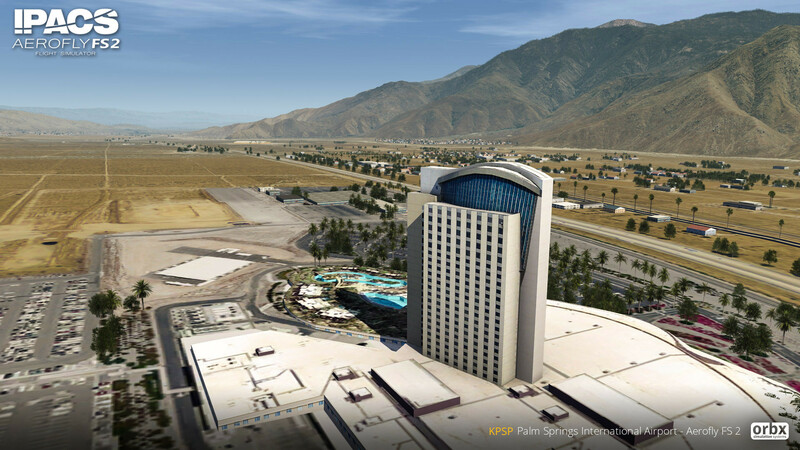 From the lush golf resorts and gated communities of Palm Springs to the harsh desert of the Coachella Valley floor, to the the high-altitude alpine wonderland of San Jacinto, there is plenty to explore in within this scenery. Palm Springs. 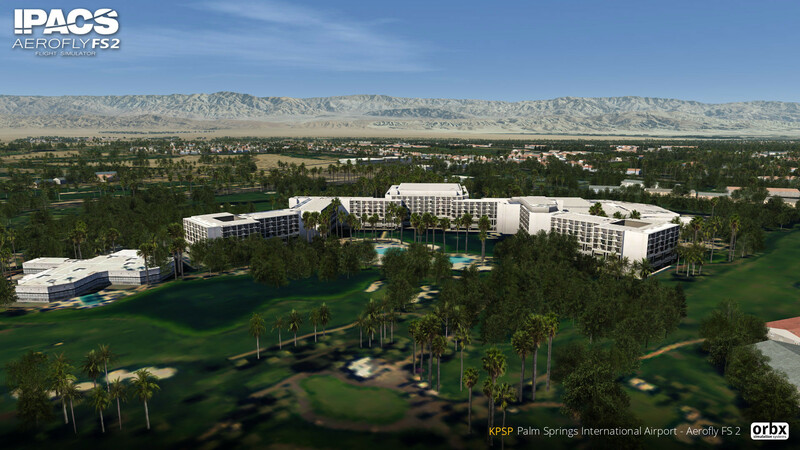 Home of Frank Sinatra, chic modernist architecture, golf resorts and stunning desert vistas. 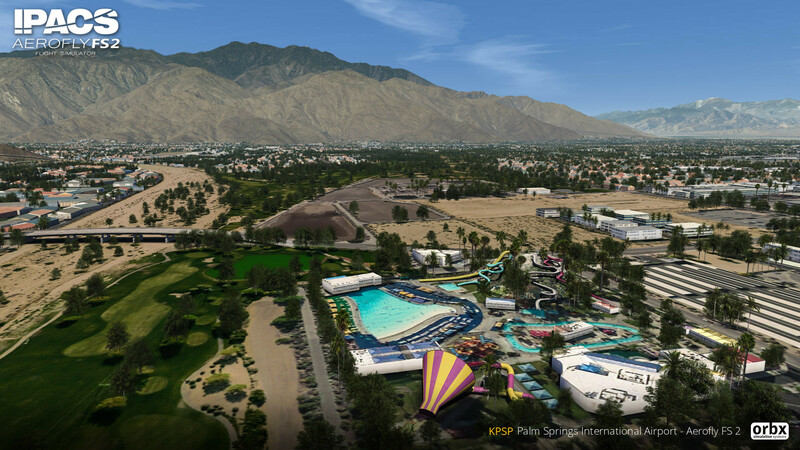 An iconic resort city just beyond the furthest reaches of the LA metropolitan area, Palm Springs became the epicenter of all things cool and swingin' from the mid 1950s onwards; the perfect get-away for Hollywood's rich and famous (and even the occasional US President!). 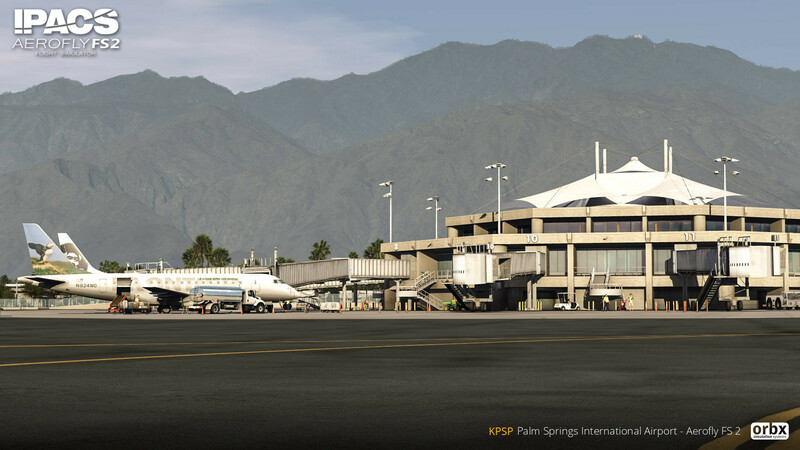 Located at the base of the towering San Jacinto Peak, Palm Springs is situated in one of the most dramatically scenic locations in the United States. Be sure to keep an eye out many Modernist landmarks around the city, as well as casinos, resorts, waterparks and even a couple of kitschy dinosaurs - these are just a few of the dozens of points of interest modeled in the scenery. 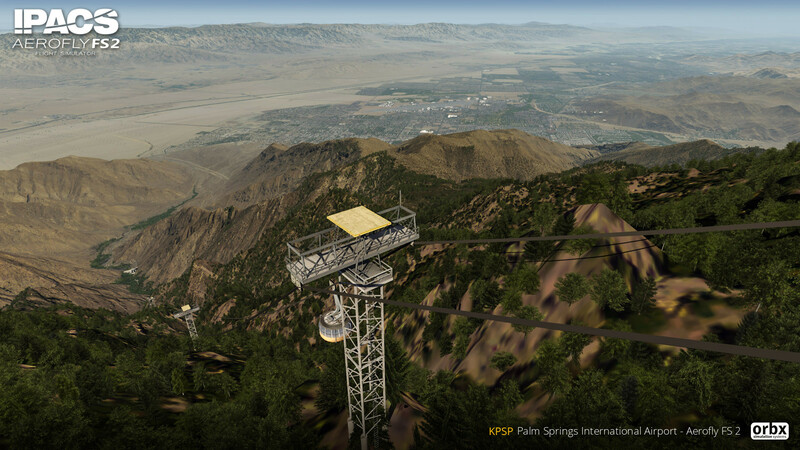 For those who are looking forward to the much-anticipated R22 helicopter for AFS2, you'll also find the Palm Springs Aerial Tramway. This marvel of engineering was created during the 1960s to serve tourists visiting the upper reaches of San Jacinto. Each tower along the tramway route includes a precarious helipad - perfect for honing your landing skills! 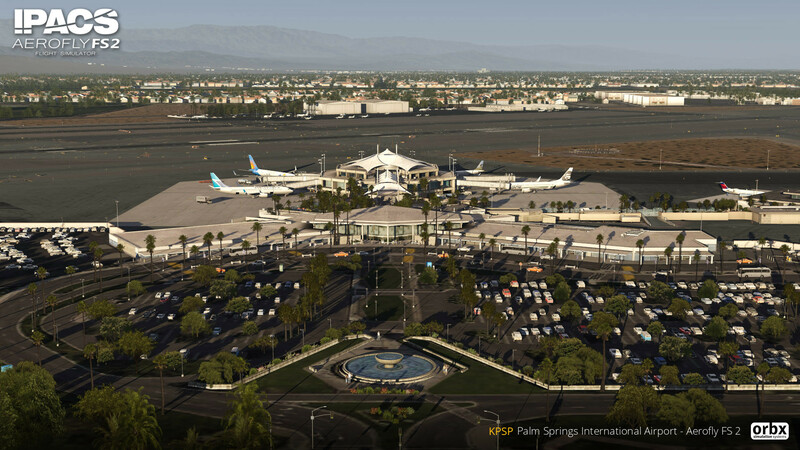 KPSP is an international airport located a short distance from the centre of downtown Palm Springs, and is currently host to twelve airlines serving the continental US, Canada and Mexico. 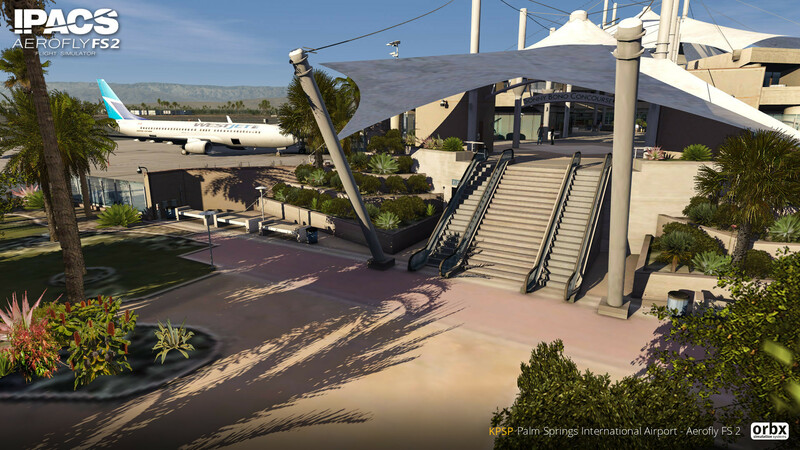 The unique terminal is a combination of mid-century Modernism (the main building) and open-air planning (the Sonny Bono concourse). 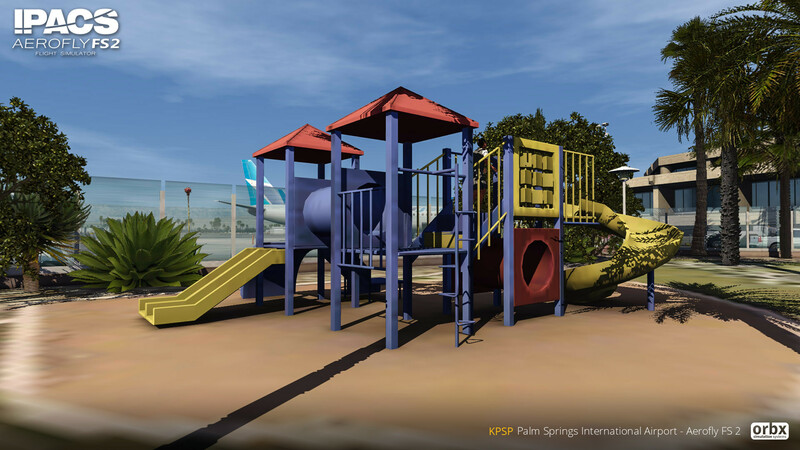 This makes for a wonderfully unique setting for your airliner flights; park alongside the outdoor terminal area that includes sculpted parkland, a children's playground, shops and even a well-known coffee chain. Beyond the terminal, there is plenty else to see at the airport. 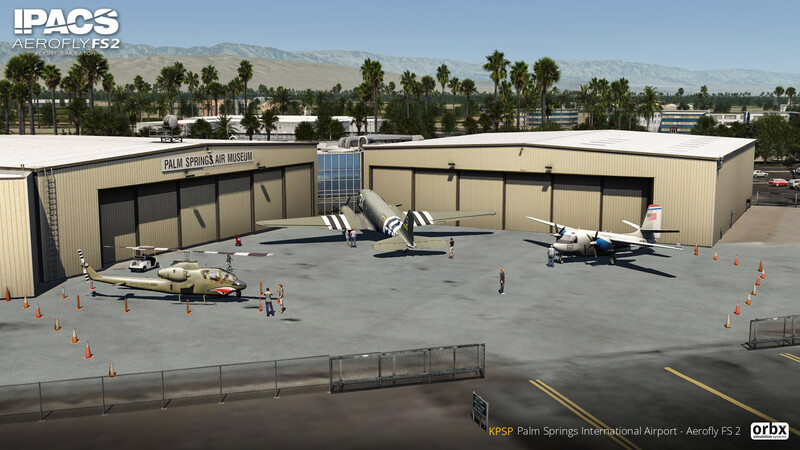 Explore the Palm Springs Aviation Museum (well worth the visit if you are passing through the area in real life), with it's wide variety of airside and non-airside exhibits. 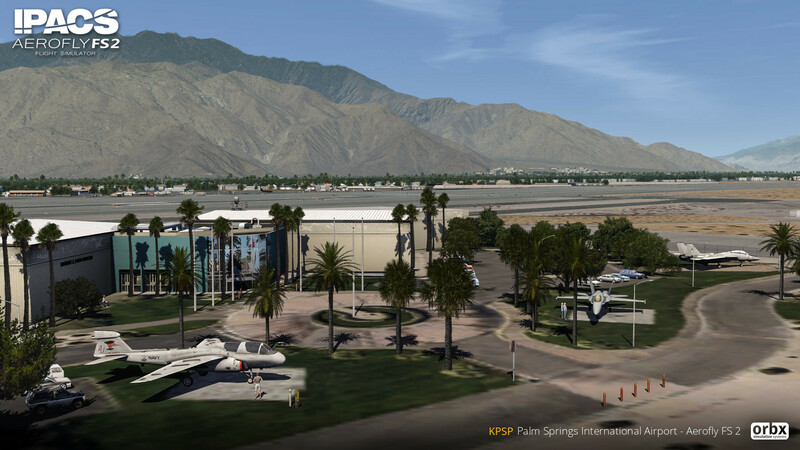 As well as this, check out the FBOs, the ongoing work at the Skywest facilities, and of course the (relatively) new control tower. As can expected for an Aerofly scenery, be sure to enjoy extremely good performance and high-end visuals, even on mid-range systems. If you are lucky enough to own a VR headset, this scenery is absolutely perfect for checking out -the feeling of speed, height and immersion are unparalleled. 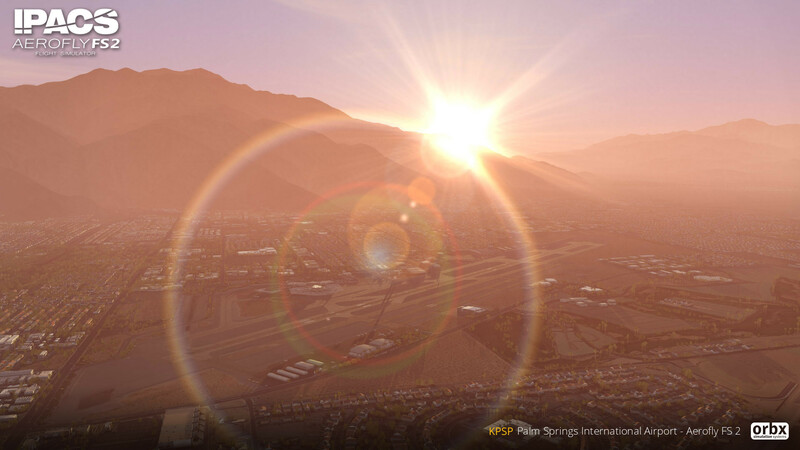 Whether you are intending to fly the Q400 up to Monterey or Eagle County, test the high-performance warbirds within the PSP circuit, terrorize the neighbours in the F-18, or take a relaxed scenic to LA in the C172, Palm Springs is your perfect base of operations for the heartland of the Aerofly world. Very nice Jarrad, extremely nice! The wow factor is off-scale high with this! Thanks! It was only a matter of time. 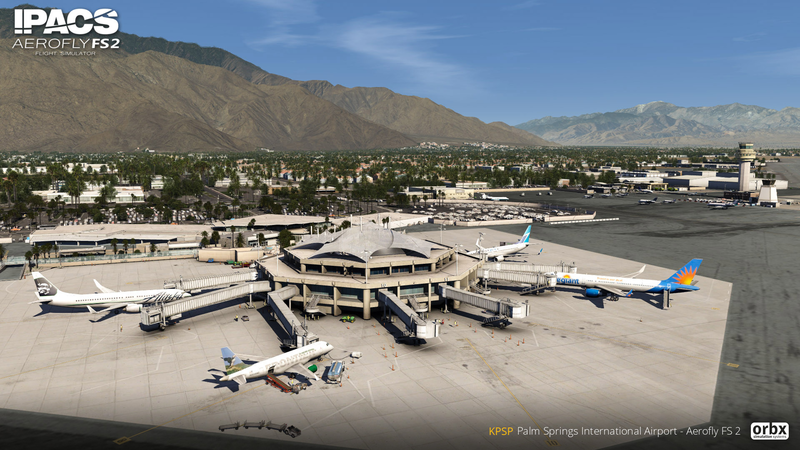 Palm Springs is perfect for AF2. Delighted to hear your news Jarrad. This is excellent news Jarrad. 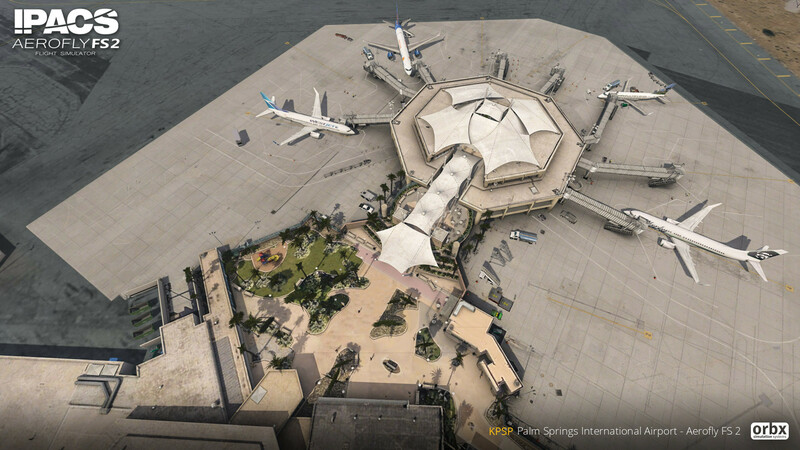 Your screenshots really show off this stunning airport project. Thank you Jarrad, very nice shots. Another marvel made, thank you Jarrad. The large collection of screenies shows that you're mastering the whole area and the smallest details as a sublime addition(DLC) to AFS2. 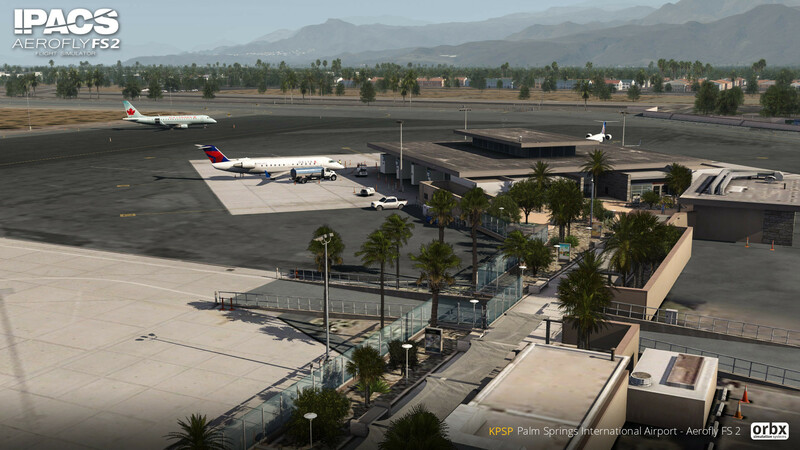 Thanks for supporting AF2 Jarrad, It look more WOW then in FSX, thanks to the AF2 graphic engine. 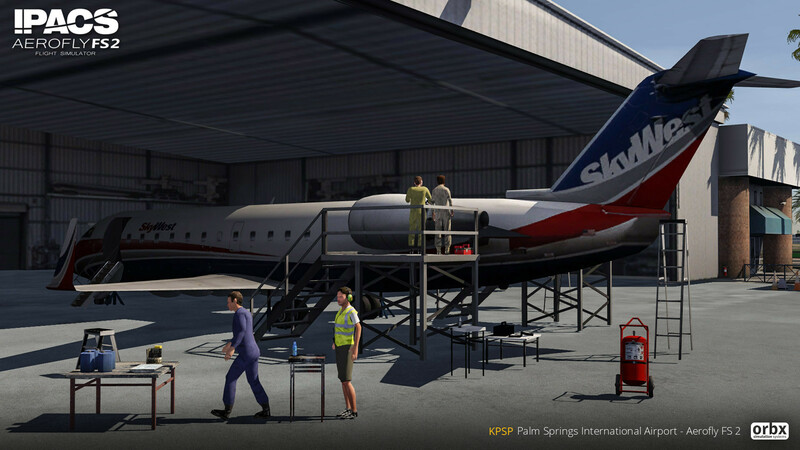 AFS2 really allows the quality of the artwork to show through in these add on airports, very much looking forward to this one. 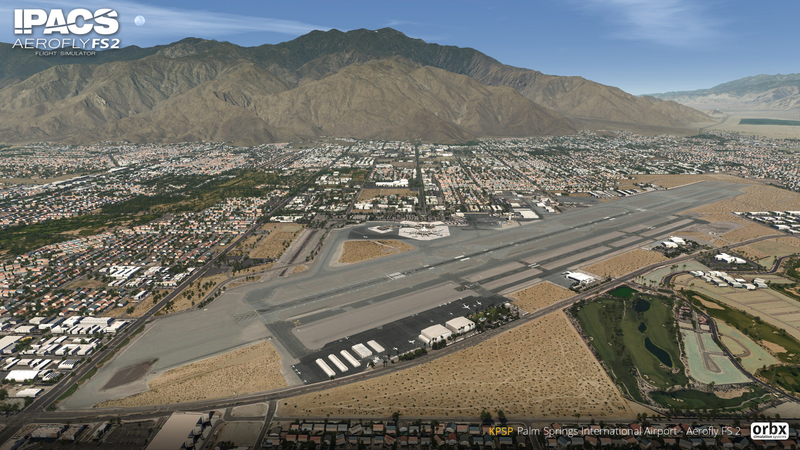 Any other Orbx Airports inside the Aerofly FS 2 territory? 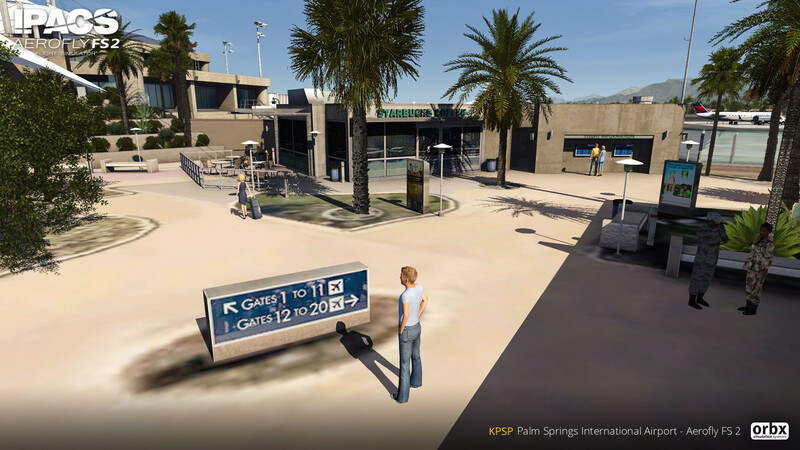 Any chance Banning Municipal and Bermuda Dunes airports will be included in this Aerofly version, similar to the FSX / P3D edition? This looks awesome - can't wait! 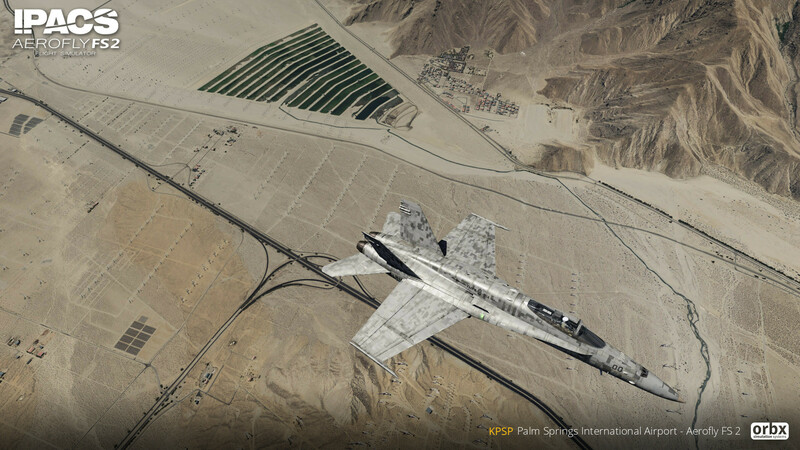 Many thanks to you and to Orbx for supporting AF2. Yes, there are a few now. KMRY, KEGE, LSGK, LOWI (not in, but very close to Switzerland). Love the airport, such high quality and nice little touches! I find the tarmac, signage, and markings in particular to be very convincing - bravo. 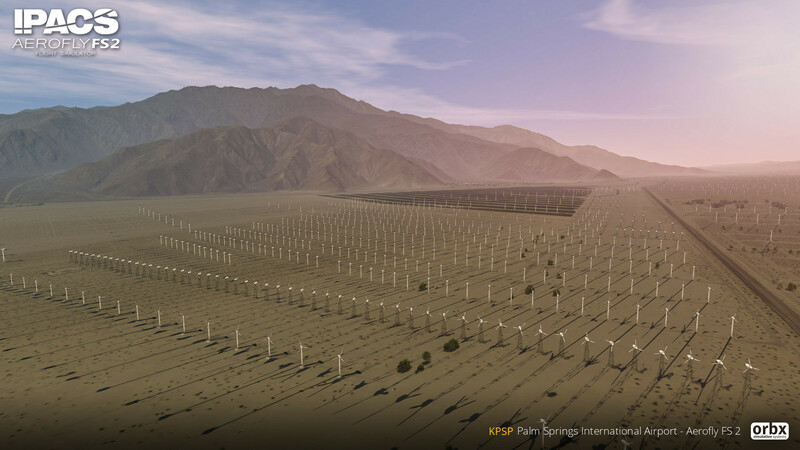 One note for future patch perhaps - I am surprised the windfarm is not animated like TrueEarth Netherlands, performance related? Would be nice to see at least some of them in motion. 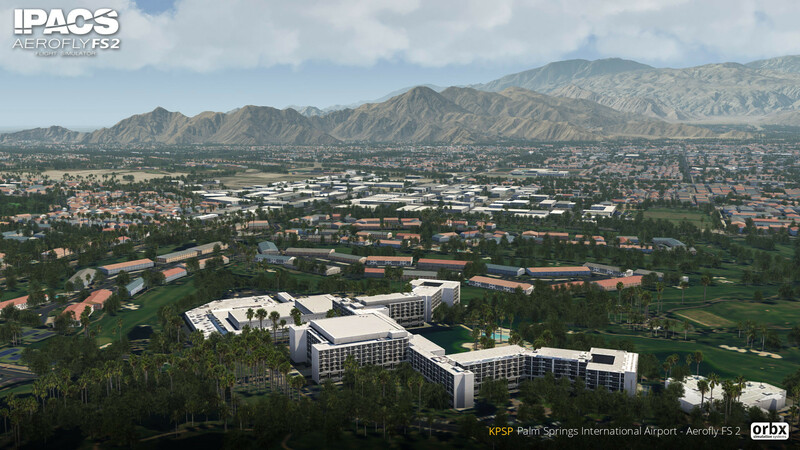 Had a quick fly around Palm Springs last night and it's really nice work, lots of little details to explore. Thanks guys. 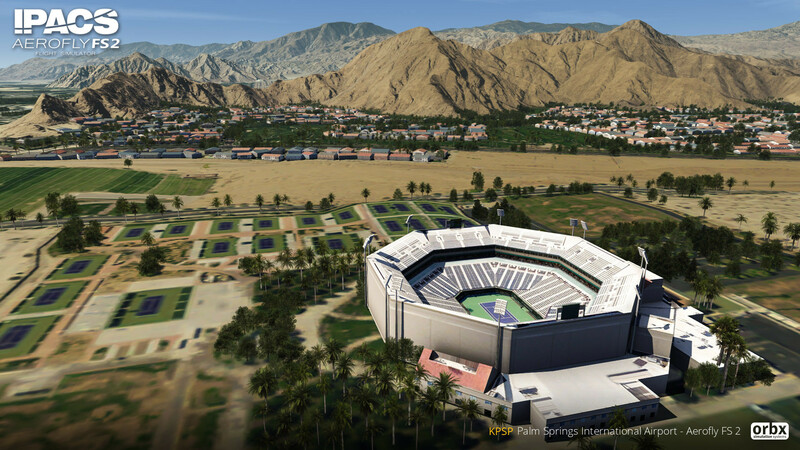 It's too bad Banning Municipal and Bermuda Dunes aren't included. 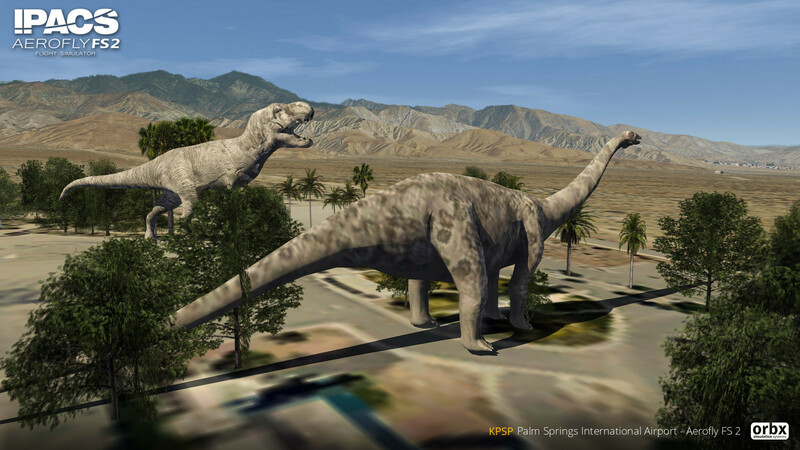 I'll still get it when it comes out on Steam, but it would be great if Banning and Bermuda Dunes could be added back in at some point. Thanks for your consideration, and as always for your fantastic work, Jarrad! Hello. Until now, this scenery has not appeared on steam. Will it be sold as a dlc over steam, like previous products? Many thanks.